The most recent peace talks between the Syrian government and some opposition forces ended ‘on a positive note.’ After dominating headlines in December, the extreme violence of Syria’s ongoing civil war has declined largely as a result of the ceasefire brokered at the end of December 2016 by Russia and Turkey. Earlier that month, the war went through one of its bloodiest periods as government forces pushed opposition forces from their remaining territory in Aleppo. After two months of relative calm, opposition and government forces came to the United Nations in Geneva in a renewed effort to bring an end to the conflict. Negotiators were faced with a difficult task, however: the conflict has been marked by sectarianism, extreme violence, and competing international interests since its beginning. How these dynamics continue to interact will affect the peace process and Syria in the long run. Syria is predominantly composed of Sunni Muslims (roughly 74% of the population), however its political and military leadership have been dominated by the Alawite community (roughly 16% of the population) since the period of French rule from 1920 until 1946. The French divided the state’s administration amongst ethnic groups, which suited the minority groups, who themselves felt threatened by the Sunni majority. The Alawite community was actively integrated into the armed forces, enabling a group of officers to overpower their Sunni counterparts in the 1963 coup that established the Ba’ath party regime. Seven years later, Hafez al-Assad consolidated power to become the president of Syria in 1970. Hafez actively incorporated Sunni Muslims into his regime by supporting the predominantly Sunni peasantry. However, when Bashir al-Assad took power in 2000 he abandoned his father’s Ba’athist-socialist ideology in favour of crony capitalism, replacing key Sunni leaders in the regime with Alawites and alienating the rural peasantry upon which the regime relied for support. 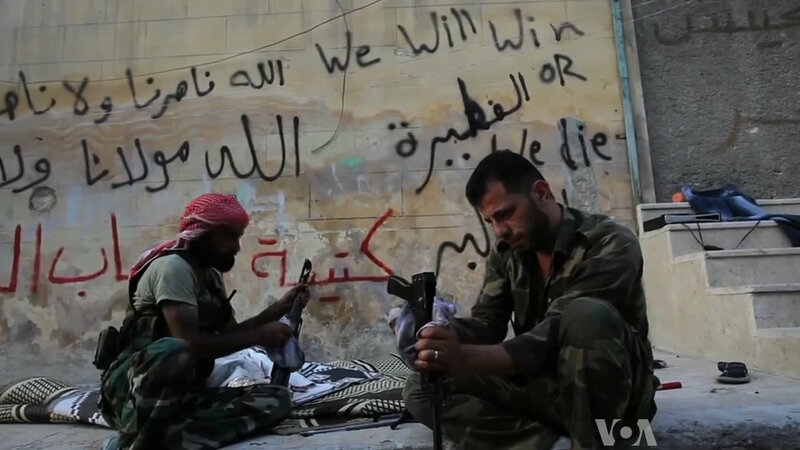 Syria’s sectarian divide has marked the civil war since its outbreak in 2011. Sunni’s were overrepresented in popular protests in 2011, dissatisfied with the regime’s repression and the country’s worsening economic situation. Extreme violence forced minority groups to chose between the stability and protection of the regime and the possibility of a full Islamist revolution. With the emergence of extreme Islamist groups such as Jahbat al-Nusra and ISIS, many minorities continue to support the regime fearing persecution under the rule of a victorious opposition. The opposition pose an existential threat to forces and factions loyal to the regime as well, motivating the regime’s continued violence. The second complicating dynamic of the civil war is the extreme violence that has taken place over the course of the past six years. Heavy handed repression contributed to the initial spreading of the violence after a brutal crackdown by government forces in Daraa, and has since shaped trajectory of the civil war. There is compelling evidence that the Assad regime has used chemical weapons on civilians, and dropped barrel bombs in residential urban areas, both of which are war crimes. Certain opposition groups have made efforts to restrain themselves on the battlefield, however they have largely been overshadowed by violent extremists fighting in the war such as Jabhat al Nusra, the Al Qaeda affiliate in Syria, and ISIS. These islamist militant groups are committed to conservative Islamic principles, and are accused of torturing minorities and massacring homosexuals. Because of the extreme violence perpetrated by both the regime and opposition, coming to a peace agreement where both sides coexist in post-war Syria will be a challenge. Additionally, it is unclear whether the opposition will be able to control its ranks and enforce a peace agreement if one is reached with the Assad regime. The final major element that will affect the future of Syria is the role of external actors. Iran, Russia, Turkey, the United States, and the Gulf States all have contrasting interests in the war. For Iran and Russia, Syria is an important political ally for strategic purposes: Syria is an important agent for Iran in the region and enables it to support its proxy in Lebanon, Hezbollah, and for Russia Syria is its only Arab ally. It is not clear how loyal either of these actors are to Assad himself, or whether they are only interested in maintaining friendly relations with Syria. Turkey, on the other hand, has opposed the regime since the beginning of the conflict, and it has begun to carve out a defensive buffer zone along the Syrian border to prevent the violence from spilling into its own territory. This has put Turkey, a NATO ally in close confrontation with Syria, a Russian ally, which could lead to a dramatic escalation if the other NATO allies were forced to intervene. Turkey remains an important ally for the United States, who have been at times funding and arming moderate opposition forces. The US has denounced the Assad regime since protests broke out in 2011, but has lacked an ally on the ground that matched its interests. Kurdish forces have been particularly effective in combating ISIS in Northern Syria and Iraq, however this has put the US at odds with Turkey, who oppose the Kurdish liberation movement. Finally, the Sunni Arab Gulf States have proactively funded opposition forces in the hopes of dissolving Iran’s sphere of influence, who they perceive as an existential threat in the region. As each side has increased its support for forces on the ground, other actors have down so in turn. Russian intervention in 2015 saved the Assad regime from what appeared to be certain defeat. The dynamics reflect both a great powers dispute between Russia and the United States, as well as the emerging regional competition between Iran and the Gulf States lead by Saudi Arabia. The result is a complex web of alliances and interests that have brought enemies into alignment and divided allies, all of which make resolving the conflict more difficult. While peace talks may have ended on a positive note according to the UN’s envoy to Syria, there is still a lot of progress to be made. It seems that a mediated peace agreement will be the most likely outcome, however it is unclear how that will come about, and which external actors will be instrumental in brokering a deal. The most recent ceasefire was brokered by unlikely allies Turkey and Russia, but the United States will likely make sure its influence is felt, and it is unclear what direction that will take under the new administration. In the long run, whoever remains in power in Syria, they will need to pursue a substantive reconciliation process given the sectarian nature of the extreme violence that has taken place over the past six years. [footnote]  Middle East. “Syria peace talks end on a positive not, says UN.” BBC, March 3, 2017. Accessed March 6, 2017. “Syria conflict: What’s been happening in Aleppo?” Newsround, January 3, 2017. Accessed March 6, 2017. Raymond Hinnebusch, “Syria,” in The Middle East, ed. Ellen Lust, 14th ed. (Thousand Oaks, CA: CQ Press, 2017), 782. Ayse Tekdal Fildis, “The Troubles in Syria: Spawned by French Divide and Rule,” Middle East Policy 28, no. 4 (Winter 2011), accessed November 10, 2016, 135. Ayse Tekdal Fildis, “Roots of Alawite-Sunni Rivalry in Syria,” Middle East Policy 29, no. 2 (Summer 2012), Accessed November 10, 2016, 155. Raymond Hinnebusch, “Syria,” in The Middle East, ed. Ellen Lust, 14th ed. (Thousand Oaks, CA: CQ Press, 2017), 794. Raymond Hinnebusch, “Syria,” in The Middle East, ed. Ellen Lust, 14th ed. (Thousand Oaks, CA: CQ Press, 2017), 806. Reese W. Erlich, Inside Syria: The Backstory of Their Civil War and What the World Can Expect (Amherst, NY: Prometheus Books, 2014), 91. Raymond Hinnebusch, “Syria,” in The Middle East, ed. Ellen Lust, 14th ed. (Thousand Oaks, CA: CQ Press, 2017), 798. Kenneth Roth, “The Right Path to a Syrian Accord.” Foreign Affairs (December 15, 2015) Accessed November 14, 2016. Reese W. Erlich, Inside Syria: The Backstory of Their Civil War and What the World Can Expect (Amherst, NY: Prometheus Books, 2014), 88. Syria’s War: Who Is Fighting and Why, screenplay by Johnny Harris, by Max Fisher, Youtube.com, October 14, 2015, accessed November 4, 2016. Andrew J. Tabler, “The New Great Game.” Foreign Affairs. August 11, 2015. Accessed November 14, 2016. Andrew J. Tabler, “The Not-So-Great Game in Syria.” Foreign Affairs, (November 4, 2015. Accessed November 14, 2016). Reese W. Erlich, Inside Syria: The Backstory of Their Civil War and What the World Can Expect (Amherst, NY: Prometheus Books, 2014), 94.